Mobotix cameras can’t send Push notifications directly. You use a 3rd party to do it. The Aussie service I had been using was expensive & complex with poor service so I looked around for a better solution. GET PUSHOVER. 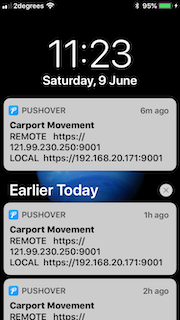 First install the Pushover App on your phone. You’ll create an account. You’ll get a unique email address like vs4gfkdvuu@pomail.net. Make a note of that because you’ll need it soon. You pay about $4.99 once only per platform and you get 7500 notifications per month. PROGRAM YOUR CAMERA. Next you setup your MOBOTIX camera to send an email to that weird pushover email whenever a particular event occurs in the camera. Obviously you’ll probably use Activity Sensor so I’ll use that in this example. That’s it! When Pushover’s servers get the email from your camera - BOOM! - they send you a push notification. Happy days. Step 1 is easy. If you get stuck hit me up on the website or the facebook. Here’s the detailed ‘How To’ for step 2. PROGRAM YOUR CAMERA. That’s it. Now go walk in front of your camera & test it. If you’ve done it right AS will trigger and you’ll get the notification. If it doesn’t work DON’T PANIC! Close any pop up window. Anything in red is bad. Actually it’s not that bad. Go back and check your email settings at Admin Menu > E-mail Profiles and correct what’s wrong.